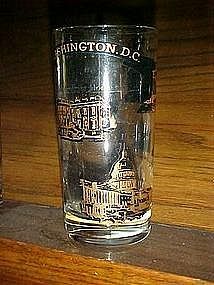 Famous tourist sights featured on this souvenir drinking glass of Washington DC. Thick bottom and measures 5 1/2" tall. Black and lots of gold embellishment. Features the Capitol building, Us. Marine Corps War memorial,The White house,and the Lincoln,Jefferson, and Washington Memorial. Bright crisp color with no fading or wear. Pristine condition.